This recipe was born during the Venetian occupation of Corfu and merges Italian and Greek flavours. It’s most commonly made with beef but we prefer the softness of slow-braised lamb. 1. Heat 1 tbsp olive oil in a large pan. Season the meat and brown in batches; set aside. Add the remaining oil to the pan; cook the onions gently for 10 minutes. Add the carrot, garlic, spices and bay; cook for 2 minutes more. Return the meat and any resting juices along with the wine and tomatoes. 2. Bring to the boil, then reduce the heat and cover; simmer gently for 2 hours. Uncover and cook for 1 hour more, until the lamb is meltingly tender and the sauce is thick and glossy. 3. Season, then remove and discard the whole spices. Cover; rest for 15 minutes. Meanwhile, boil the pasta in salted water until al dente; drain. 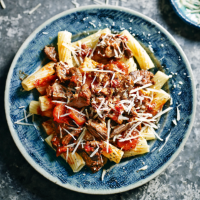 Serve the lamb over the pasta; top with parmesan, if liked. Follow step 1, then secure the lid on the cooker and bring to high pressure. Reduce the heat to low and cook for 25-35 minutes or until the lamb is tender. Remove the lid and briskly simmer for 20-25 minutes, stirring often, until the sauce is thickened. Follow step 3 to serve. Put all the ingredients – except the olive oil (it isn’t needed) and pasta – in a slow cooker. Cover and set the cooker to low for 6-8 hours, until the meat is really tender. Strain the sauce into a saucepan and set the meat and veg aside. Briskly reduce the sauce by 2/3, then mix everything back together and season. Follow step 3 to serve. This recipe was first published in Sun Feb 01 15:47:00 GMT 2015.